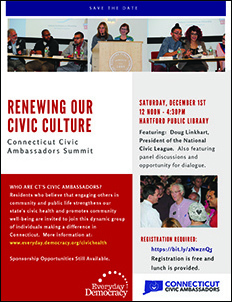 HARTFORD, CT --The Connecticut Civic Ambassadors Summit, Renewing our Civic Culture, sponsored by Everyday Democracy and the Hartford Public Library, will feature a keynote by Doug Linkhart, president of the National Civic League. Linkhart will talk about how to engage community residents and public officials in conversations to make communities better places to live for all! The summit will also feature two outstanding panels highlighting some of the great civic work taking place in Connecticut. Feel free to download and post the flyer.